This is a weekend recipe. Make a huge batch and keep it to feed yourselves for a few days (or share it, if you must), it only improves with time. It may have plenty of ingredients and take 3 hours to make, but I promise you it’s not too much effort and it is SO worth it. I’ve put a few notes in so you can see if it’s possible to leave ingredients out. Of course it’s best to have the whole bunch, but I understand not everyone has access to all these ingredients. 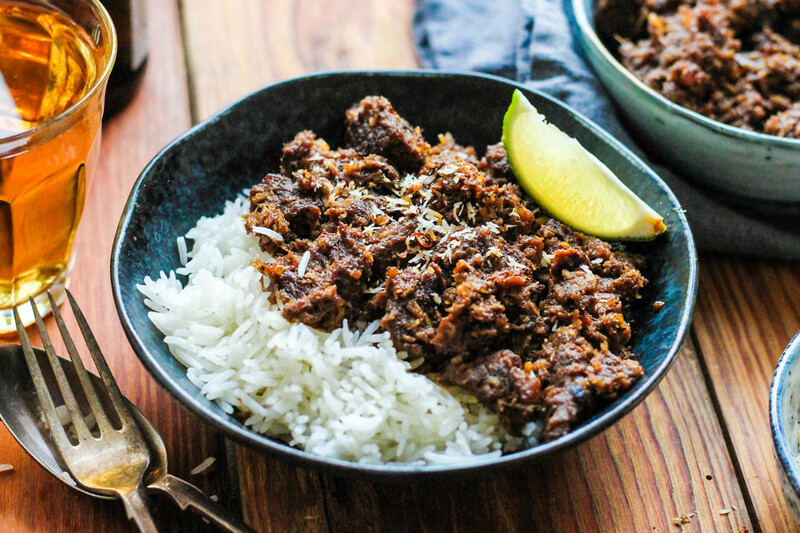 Beef rendang is a most wonderful, Indonesian dry curry, so what starts in the pan as spices, meat and coconut milk simmers down until it is a concentrated curry with the sauce just coating the flaky, tender beef. 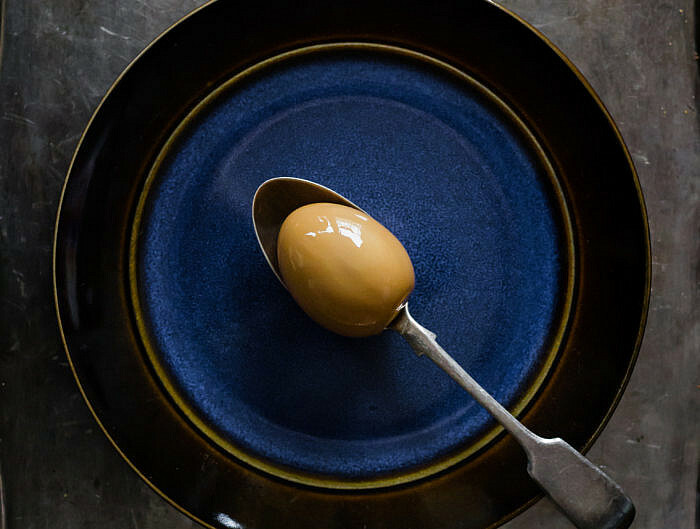 You just have to whizz up a paste and stir a few times then you’re there. Promise. Disclaimer: So I actually forgot to photograph the pickled cucumber (annoyingly) but it is such a wonderful addition to the dish. 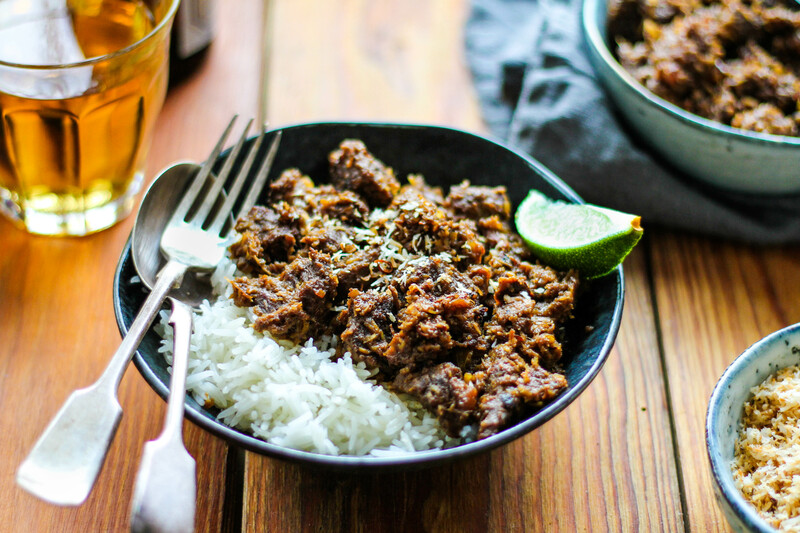 The rendang is quite a rich curry so having some tangy pickle to cut through is dreamy. Before you start cooking, have all the rest of your curry ingredients prepared in a bowl. 1. PICKLE YOUR CUKE: Finely slice your red chilli. Halve the cucumber lengthways and slice on the diagonal. In a medium bowl, layer the cucumber slices with the chilli, rice vinegar and pinches of sugar and salt. Add the star anise. Leave for half an hour at least (better for longer) and stir every now and then. If you don’t want them spicy, leave the chilli out. 2. SPICE PASTE: Put all your spice paste ingredients in a food processor and whizz until fine. You can also use a staff mixer, but make sure you’ve whizzed everything and you don’t have chunks of lemongrass stalk. 3. BROWN BEEF: Heat 1 tbsp oil in a large, heavy based saucepan. 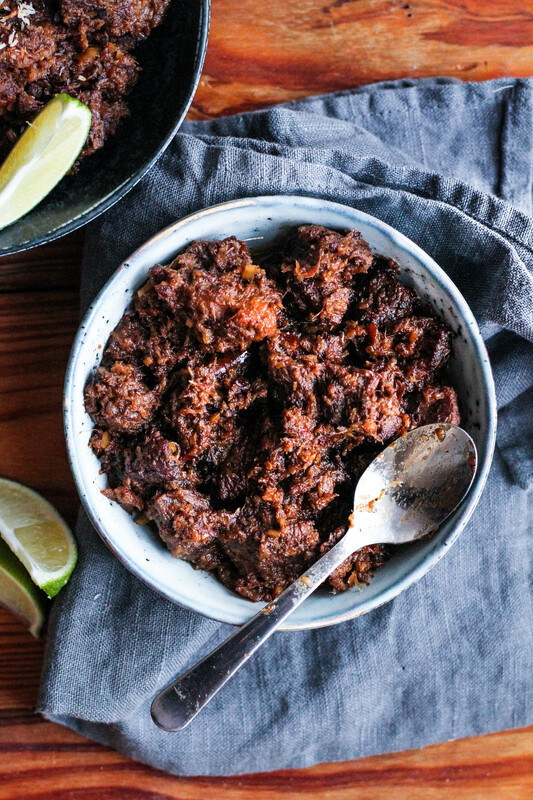 When hot, brown your beef chunks in two batches and set aside. 4. CURRY: Add a dash more oil, turn the heat down to medium low and add the spice paste. Cook for a few minutes until the spice paste is a bit dryer and darkens slightly. Add the browned beef and the rest of the curry ingredients (coconut, spices, etc) and give it a good stir. Bring up to a simmer then reduce the heat to just bubbling and whack the lid on. Simmer for about 1 hour and 15 minutes, stirring very occasionally. 5. TOASTED COCONUT: In a dry frying pan, gently toast the desiccated coconut with a few slices of dried chilli until golden brown. 6. BEEF FALL-APARTNESS: By this point the beef will be quite tender but not falling apart. Turn the heat up to medium and cook for 30-40 minutes, reducing the sauce and tenderising the beef. Stir it every now and then at the beginning, then more frequently towards the end as it starts catching on the bottom of the pan. 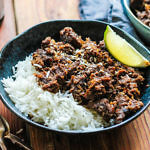 Keep cooking until the curry sauce is a a dark brown paste that coats the beef, and the beef is tender enough to fall apart. If it isn’t tender yet, add a splash of water and keep cooking. 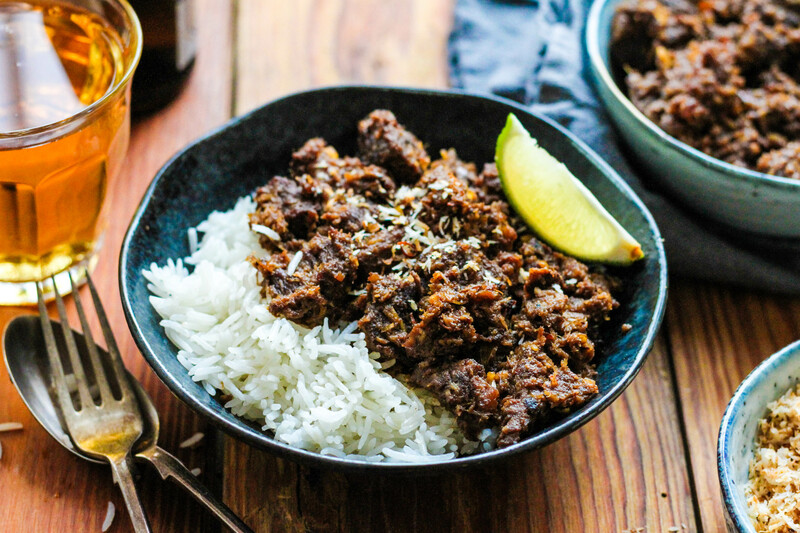 Serve it with fluffy rice, pickled cucumber, a wedge of lime and spicy toasted coconut. And beer, it’s great with beer.